Let’s eat ehomaki sushi rolls! In part three I told you about the bean throwing and holly sprig and sardine head Setsubun traditions, but there is more to Setsubun than that! In Japan it is customary to eat a sushi roll composed of seven ingredients called ehomaki on the day of the Setsubun. It is said you will have a thriving business and good health if you eat ehomaki on Setsubun. Part 4 is about ehomaki! Ehomaki is a sushi roll eaten on the day of Setsubun said to bring good luck. You need to eat the ehomaki facing the “lucky direction” decided by the Chinese astrological calendar. Why is ehomaki eaten on Setsubun? The ehomaki tradition is said to have started in the geisha districts of Osaka in the Edo period. 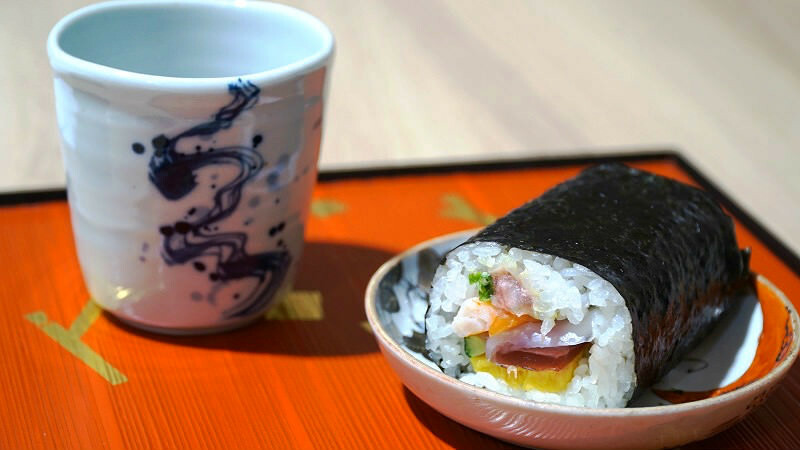 There are many theories on why the ehomaki is a sushi roll, it is said a big roll can catch all the prosperity coming from the lucky direction, and that the black seaweed of the roll looks like a demon’s club, and by eating it you can drive off evil spirits. 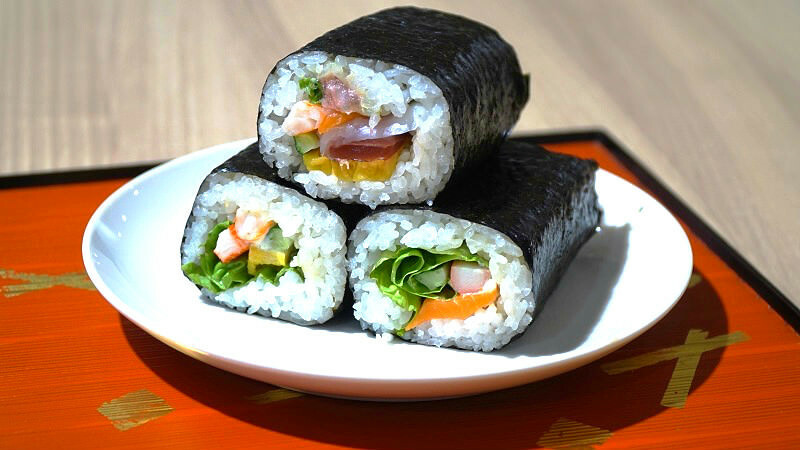 Actually the name ehomaki is a rather recent invention, and it was actually the convenience store chain 7-11 that started to call this sushi roll by the name ehomaki. Before this the sushi roll was not known as ehomaki but as “marukaburizushi”, sushi roll you don’t cut but eat the way it is. There are three rules on how to eat ehomaki. First rule is that you have to face the lucky direction of that year. 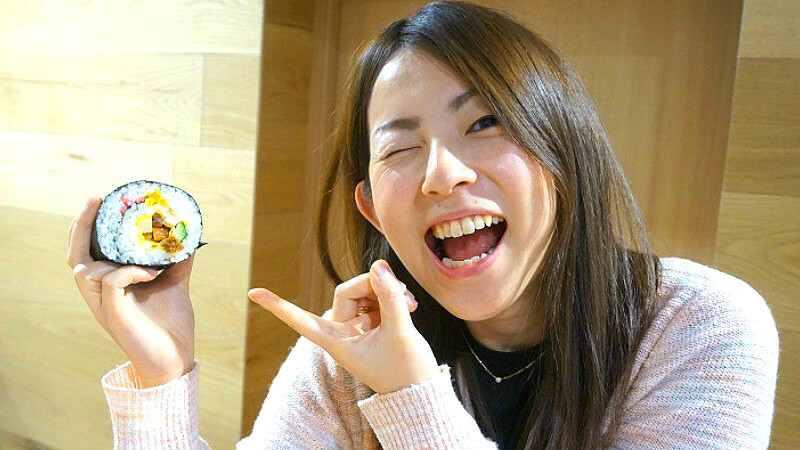 The second one is to eat the roll without saying anything. If you speak before you finish eating the roll, you will lose all your good luck. The third rule is that you should not cut the roll into smaller pieces, you have to eat it whole. The sight of a family silently eating ehomaki all facing the same direction is quite queer. What way should I face? Of course now you want to know which way to face! This year’s lucky direction is almost north, “north-north-west”. 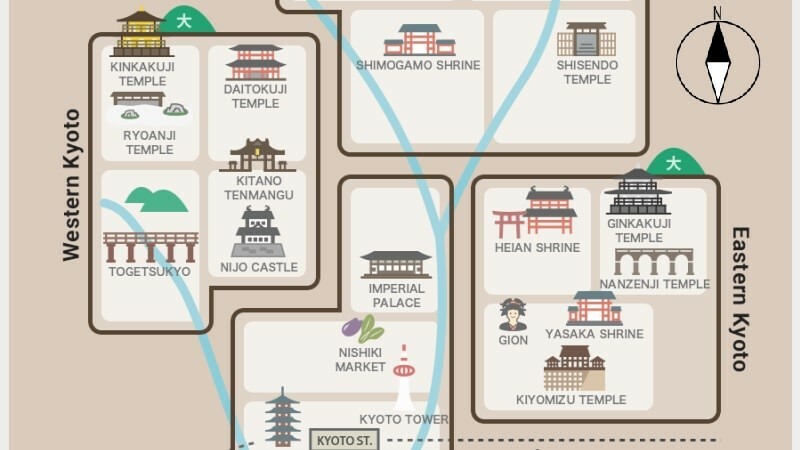 From Kyoto station Kinkaku-ji Temple and Mount Daimonji are in north-north-west so if you face their direction you are facing the right way. If you are in Kyoto during Setsubun we hope you will face the right way when eating ehomaki! There are no rules on what has to be inside ehomaki, so nowadays there is something for every taste. I hope you can find an ehomaki you would like to try from the ones we are going to tell you about! The classic ehomaki contains seven ingredients because of the seven gods of good fortune. The ingredients are not always the same but normally your ehomaki will contain conger-eel, omelet, shitake-mushrooms, powdered fish, cucumber or other green vegetables, kanpyo – dried gourd, and one other ingredient decided by the shop, is the normal, classic ehomaki. A Deluxe Ehomaki Popular with Young People! Recently a deluxe version of ehomaki containing tuna, salmon, salmon roe, and other seafood has been getting popular. 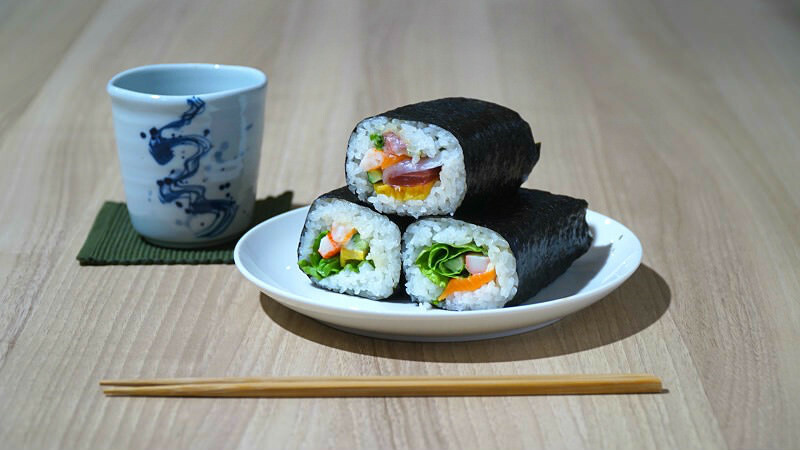 After all this is Japan, the birthplace of sushi, so it is only natural that a seafood sushi roll would get popular. This deluxe seafood ehomaki with its light taste is a sure hit with sushi lovers. Basically, no matter what type of sushi roll you eat, you will still get the good luck so just choose the one you like! If you don’t like fish you can get a roll with meat or salad inside, or a completely different type of roll, a roll cake. There are a lot of choices, so we are sure you can find one you like! 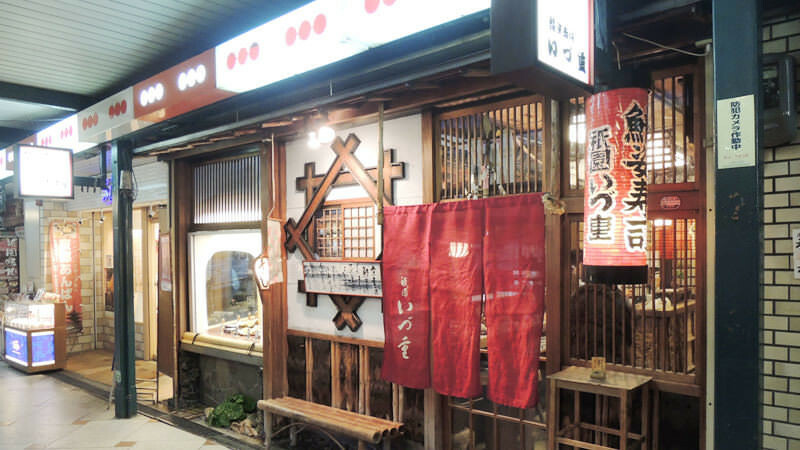 Many sushi restaurants in Kyoto have ehomaki on their menu during Setsubun. 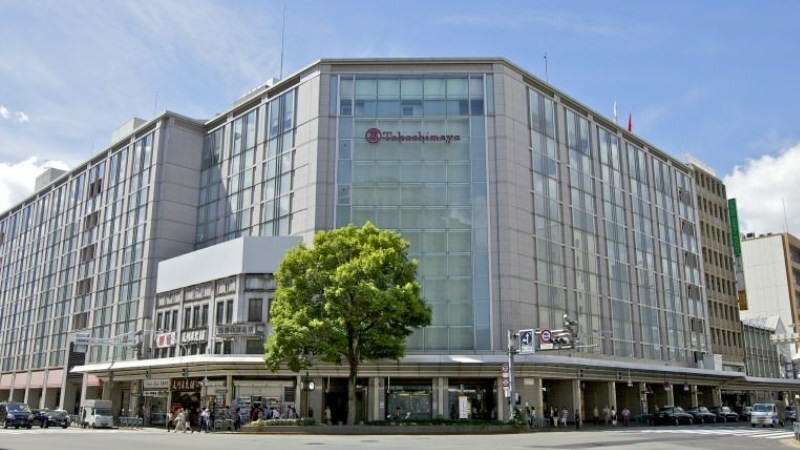 We will recommend you some restaurants that have a nice atmosphere and some where you can buy take-away ehomaki! Izuju is a sushi restaurant right across Yasaka Shrine. Ehomaki is on sale from February 2nd to 3rd. 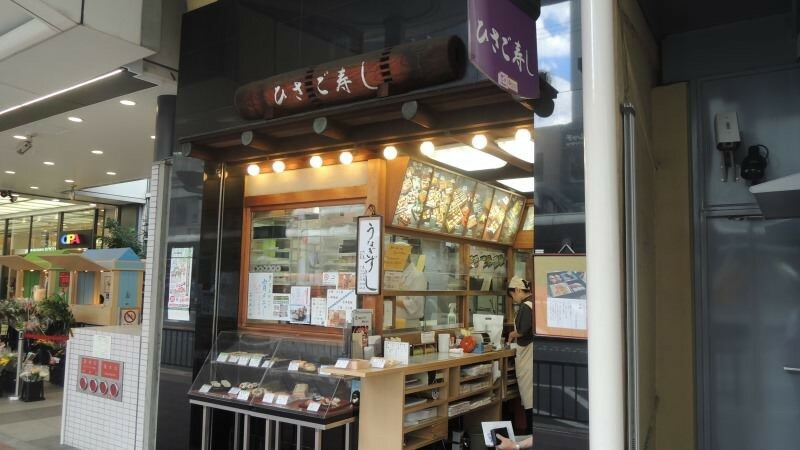 Hisago-zushi is a sushi restaurant in Shijo Kawaramachi. Ehomaki is on sale only on February 2nd. Sushi no Musashi is a conveyor belt sushi restaurant in Kyoto Sanjo. Ehomaki is on sale only on February 2nd. 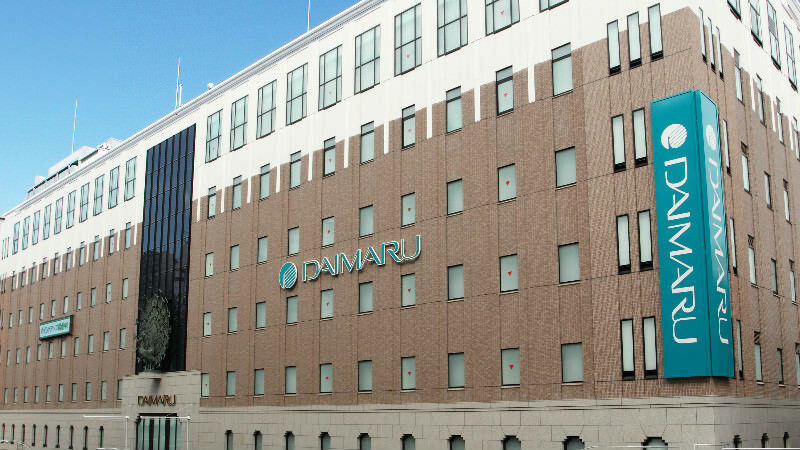 Besides these sushi restaurants you can also buy all kinds of ehomaki from convenience stores, supermarkets, and department stores like Takashiyama and Daimaru. 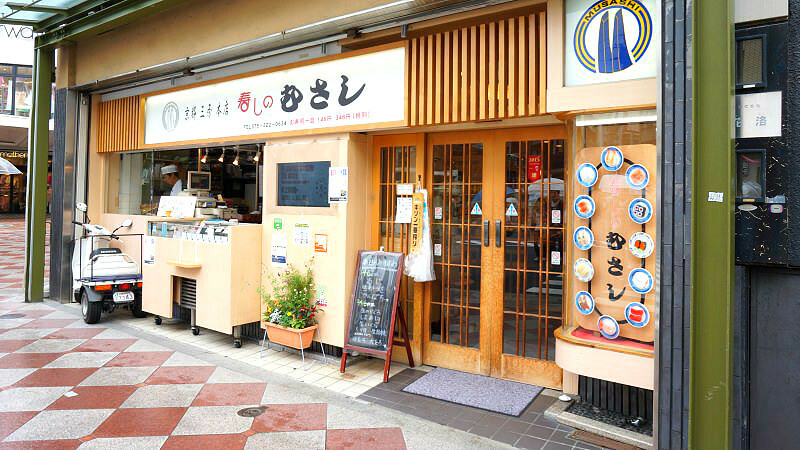 These places are especially good if you just want to have ehomaki, or want to try different types of ehomaki. In this these feature articles I introduced many aspects of Setsubun traditions. In the past Setsubun was a serious event to drive off the demon that brought bad luck by throwing beans at it. Now it has become a kind of relaxed festive event that everyone can enjoy. If you are even a little bit interested in Setsubun, we hope you will try to enjoy Setsubun the Japanese way!